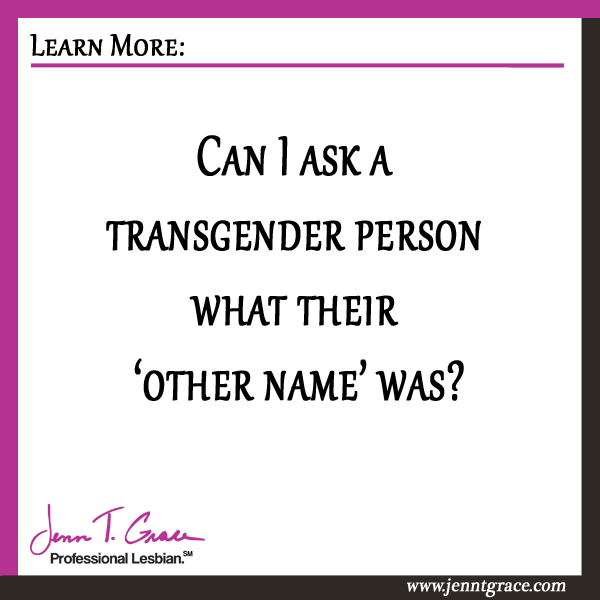 Can I ask a transgender person what their ‘other name’ was? Home » All Things Transgender » Can I ask a transgender person what their ‘other name’ was? Listen up. You know I love you. I appreciate you. I enjoy that you frequently read my blog and follow what I am doing. But sometimes I feel the need to pull a tough love moment with you. This is one of those occasions. A few months ago I was working on an event specifically around the transgender community. A much underserved part of the LGBT community generally speaking. Let me begin by being clear with you – Please, do not ever ask someone who is transgender what their ‘other name’ was or is. I’ve written about other topics on this blog in a similar vein, such as don’t ask the lesbian couple who gave birth to their child. This is one of those statements that there is really no alternative other than don’t ask. In the case of asking the lesbian couple who gave birth, my advice is usually, you don’t ask this unless you have built a very good rapport with the couple. This is not a question you ask in the first few minutes of meeting a lesbian family. (Read more on this kind of situation here.) As a married lesbian, raising children, this is something I can speak directly to. Now, I am not transgender so I cannot speak on behalf of the entire transgender community, however I do know from close personal friends that this is not something you should ask. Ever. At the event I was managing we had a question & answer portion at the end where anyone could ask what was on their mind regarding the topic of transgender. Having any live Q&A can be risky for any kind of event. The uncertainty of what someone might ask, possibly being caught off guard by a question or opening the door to being heckled or berated from a crowd are all chances you have to take. I’ve found that they often go smooth, but you have it in the back of your mind that something could happen. At this particular event, the awkward question of ‘what was your other name?’ came up. Fortunately, I work beside some amazing people who are very skilled at pushing back on questions and working with a crowd. My friend who was fielding this inquiry stated very clearly ‘what does it matter what my given name at birth was?’ The audience member didn’t really have a well articulated response, but what came out was she was curious. Guess what? Curiosity is common. It’s okay to be curious about things. Hell, I am the queen of asking people in service positions the most random questions because I’m curious. A fine example of this just happened this week – I was in my local bank the other day, who is merging with another local bank and we got into a whole discussion about the merging of the two systems and the impact on the customers, etc. I went in to cash a check and 15 minute later this is what I’m discussing with the branch manager. It happens a lot. Curiosity is okay, but you need to understand where boundaries lie. 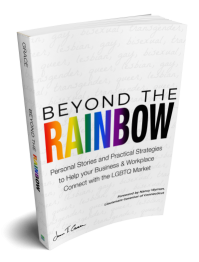 In the example of working with the transgender community, please do not ask that. It is not polite. If your client or customer wants to reveal that information to you, they will, but out of respect don’t ask it in the first place. I have many friends in the transgender community that I don’t know what their given names at birth were. Nor do I care to know or to ask. I know them for who they are today and how they present themselves today. That is ultimately all that matters. Just like which two moms gave birth to the children. Does it matter? No. What matters is the children are in a safe and loving two mom household.